Object ode: The printer | spifftacular. This is the first in a series of occasional posts about objects I love and love using (totally unsponsored, just unabashed object obsession). I had been thinking for awhile about writing about objects–the tangible, seemingly sundry things that make my giddy and grateful just about every time I use them. Yet I was hesitant to admit to my obsession with things. It feels so materialistic, so shallow, so unholy, to be infatuated with the things that moth and rust doth corrupt and thieves break through and steal. So here we go. Hello, my name is Holly, and I love things. I had a printer in college that came with my very first laptop, but after I graduated it took up precious space and used expensive ink, so I got rid of it. Fortunately our first two apartments in Philly were within walking distance of a FedEx Office (which I still think of in my head as Kinkos), so all was well. It was sometimes a pain to put on to schlep myself over there just to print a few pages, but it was livable. Then we moved to a neighborhood that was lacking in nearby FedExes, and I got an assignment at church (Relief Society secretary) that required enough printing, I felt, to merit owning a printer again. 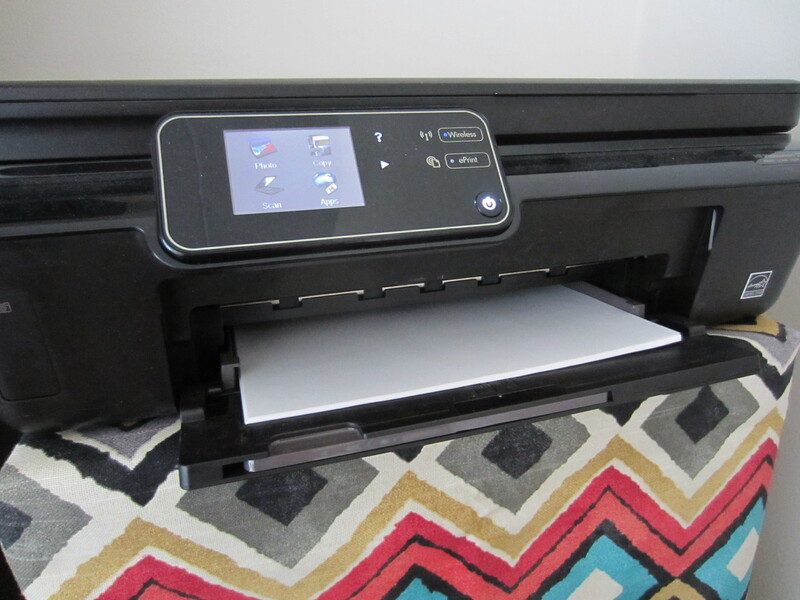 The one I found after extensive comparison shopping isn’t anything special, but I thought it was a good deal with decent features and, most importantly, has economical ink (it’s an HP Photosmart 5514). But simply having a printer is what makes the difference. Whenever I use it, I am not simply empowered. I am DRUNK WITH POWER. Just ask Dave and he will affirm that I frequently get unreasonably excited about printing. It’s all about the power of creation: The same pride that swelled within me when I managed to grow a tiny human in my womb resurfaces whenever I print something. See that totally legit-looking, neatly organized sign-up sheet? And that handy shipping label? And that photo of my child? They didn’t exist a second ago. But now they do. Why? Because of me and my printer, yo. Please feel free to stand in awe of my power of creation. Once again I have enjoyed a mid-day read of your blog. 🙂 Your talent to express continues to impress me and cause me again to encourage you to perhaps pen a book of some sort. I completely understand. For me it’s my computer. Entertainment, education, link to the rest of the world.